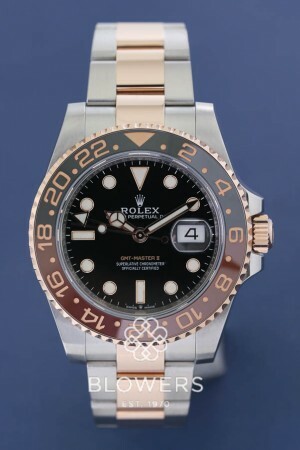 Rolex GMT-Master II model reference 126711CHNR. 40mm diameter steel case with larger winding crown, water resistant to 100 meters. Automatic chronometer movement calibre 3285, a new-generation movement entirely developed and manufactured by Rolex. Black dial with maxi luminous hour markers and luminous hands. Black and brown ceramic bi-directional bezel. Polished and brushed steel case, 40mm diameter with larger winding crown, water resistant to 100 meters. 18ct Rose Gold and steel Oyster lock bracelet with comfort extension link. Box and papers dated June 2018. SKU: 3007308. Categories: Gents, GMT-Master II, Rolex.